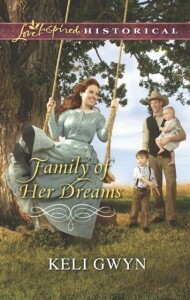 you can enter to win a copy of Family of Her Dreams (US residents only). See how below! to get a bird’s eye view of my ranch. because very little of it comes out of his mouth. get into my characters’ heads. the rewards far outweigh the risks. the pain eases over time, enabling a person to experience love anew. With it, one is rich even if she has little. I have a wonderful marriage, and I’m dearly loved. Talk about being blessed. Keli, tell us what inspired this story? Country where I live. There’s a wealth of history here, which fascinates me. two motherless children—and their handsome father? secrets come to light. Secrets that could destroy everything. Jess. It’s great to be here. I have a question for your blog’s readers. I’m learning to live on less, what is one money-saving tip you’d recommend? when it runs out, it’s out until I hit the grocery store the following week! are her fictional worlds, historical museums and other Gold Rush-era towns. cyber home at www.keligwyn.com, where you’ll find her contact information. job, she’ll keep any emotions about her boss to herself. could he ever admit to seeing her as more than just an employee? 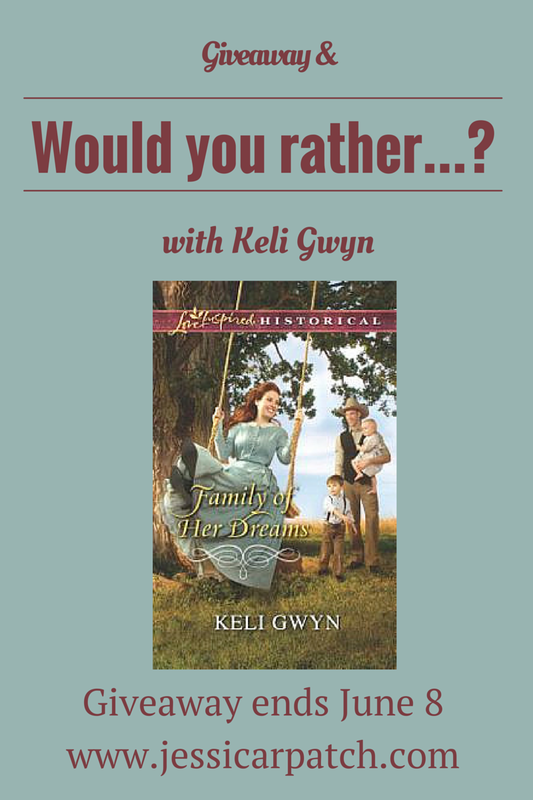 Posted in UncategorizedTagged Family of Her Dreams, giveaway, historical romance, Kely Gwyn, LIH, Would You Rather5 Comments on Would You Rather with Keli Gwyn! Plus, a Giveaway!